The Pot Magnet / Cap Magnets listed below are arranged by PULL FORCE data. 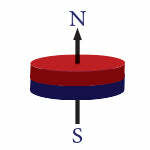 These holding magnets provide a big holding force in a small package. These can be used as holding magnets or mounting magnets on white boards and any other magnetic surface. We have the capability to manufacture almost any size of holding magnet, so If you require a specific size mounting magnet, please contact us or use our online custom magnet quote form.